Staff Correspondent: The Supreme Court has granted garment owners association BGMEA an additional year and ten days to finish its demolition of its illegally constructed headquarters in Dhaka’s Hatirjheel. The court said it would not extend the deadline any further. The court set April 12, 2019 as the new deadline on Monday. An appellate bench led by Chief Justice Syed Mahmud Hossain passed the order after the BGMEA signed an undertaking at the instruction of the court. 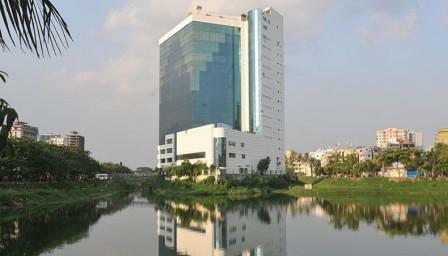 In 2011, the High Court found that the BGMEA building had been constructed by violating the law meant to protect wetlands and ordered its demolition. The court said the building was hindering the water flow of Begunbari canal and hampering the Hatirjheel Beautification Project, calling it ‘a cancer’. A review petition on the decision was dismissed by the Appellate Division and the BGMEA was told to complete demolitions by September 12, 2017. An additional seven-month extension granted on October 8 of last year was to end on April 12. The judges told the BGMEA at the time extension hearing that they would not extend the deadline further. But the BGMEA filed another petition on Mar 5 seeking a full-year extension. The top court granted the extension on Monday.